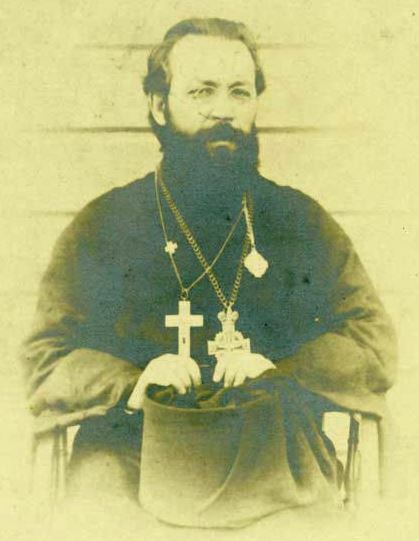 The New Hieromartyr Anatole (Kamensky) of Irkutsk was the archbishop of Irkutsk of the Church of Russia during the early Soviet period. He was a missionary priest in North America during the latter decades of the nineteenth century. His feast day is September 20. He is also commemorated on the Feast of the Synaxis of the New-Martyrs of the American Land on December 25. Alexei Vasilevich Kamensky was born on October 3, 1863 in the Samara diocese in Russia. He attended the Samara Theological Seminary, graduating in 1888. After his marriage he was ordained on August 6, 1888 as the priest for the church of the village Hilkova in the Samara diocese. Following the death of his wife, he entered the St. Petersburg Theological Academy in 1891, graduating with the degree of Candidate of Theology in 1895. On August 26, 1895, he was tonsured a monk with the name Anatole by Bishop Nikandr (Molchanov). He was then assigned to the North American mission of the Church of Russia as rector of Archangel Michael Cathedral in Sitka, Alaska, with duties as superintendent of the missionary schools and Dean of the Sitka District. In 1897, he was raised to the dignity of archimandrite. In 1899, Fr. Anatole was appointed to head the missionary school in Minneapolis, Minnesota. The school had been established in 1897 and became the first Orthodox seminary in North America in 1905. In 1903, Fr. Anatole was transferred back to Russia and assigned as rector of the Odessa Theological Academy. On December 10, 1906, he was consecrated Bishop of Elizavetgrad, vicar of the diocese of Kherson in what is now Ukraine. The consecration was held at the Holy Trinity Cathedral of Alexander Nevsky Lavra in St. Petersburg. The celebrants included Metropolitan Anthony of St. Petersburg and Ladoga, Metropolitan Vladimir of Moscow, and Metropolitan Flavian of Kiev. On July 30, 1914, Bishop Anatole was appointed Bishop of Tomsk and Altai. He was a member of the pre-revolutionary State Duma and attended the All-Russian Church Council of 1917-1918 in Moscow. After the Bolsheviks took over the government of Russia, he joined the White Army in 1919 and became one of the main organizers of “Teams of the Sacred Cross” in Admiral Kolchak’s White Army. After the defeat of Kolchak’s armies he remained in Russia and in 1920 he was appointed Bishop of Irkutsk. Bp. Anatole was arrested by the Bolsheviks in April 1922 and was charged with hiding church property. In July he was sentenced to be executed. However, the sentence was reduced to ten years imprisonment in strict isolation. With his imprisonment he retired as bishop. In 1924, he was released from prison and appointed Archbishop of Irkutsk by Patriarch Tikhon. The Provincial Administration, however, refused to allow him to register as Archbishop of Irkutsk or to occupy his cathedral, that had been taken over by the Living Church. Abp. Anatole took up residence in Omsk. The time and place of Abp. Anatole’s death is uncertain. His repose is dated variously as in November 1924 or on September 20, 1925 as well as September 20, 1920 and January 24, 1921. In one account of his death he is recorded as dying quietly in Omsk: “He was vouchsafed a blessed repose in the altar of the Bratsk church during the Vigil for Sunday. Sensing the weakness of his heart, he said good-bye to all and, sitting in a chair as the choir was singing ‘Glory to God in the highest’, he quietly died”. Archbishop Anatole was glorified as a Russian New-Martyr on the calendars of the Moscow Patriarchate and the Russian Church Abroad and is known as the New Hieromartyr Anatole (Kamensky), Archbishop of Irkutsk.